The architecture critician Sigfried Giedion called him the “Magnus of the North”: Alvar Aalto (1898-1976) is the most famous Finnish designer of his generation and one of the most important representatives of the “human” modernity in architecture. 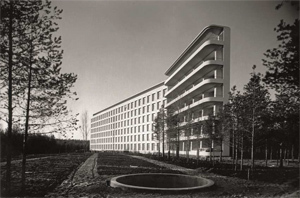 His buildings, such as the Paimio Sanatorium (1933) or the Villa Mairea (1939) embody a grandiose interplay of organic rooms, forms and materials. Aalto’s Paimio Chair (1931 – 1932) and his Stool 60 (1933) are milestones in the development of modern furniture, his Savoy Vase (1936) is still a symbol of Finnish design. With “Alvar Aalto – Second Nature”, the Vitra Design Museum shows an all-including retrospective about the grand Finnish architect and reveals new aspects of his work. Aaltos affinity for organic forms leads the exhibition back to a tight dialogue with important artists of his time: among them are László Moholy-Nagy, Jean Arp, Alexander Calder or Fernand Léger. Works of these artists and others are contrasted with Aalto’s works and they emphasize his importance as key figure of the modern avant-garde. Aalto is portrayed as cosmopolitan interested in arts, theatre and media, he considers himself as “chef d’orchestre”, who connects all kinds of art to one harmonic, symphonic whole. This is how vital rooms of warm, organic quality emerged, embossed by an impressive combination of volumes and construction materials, terraced grounds and ceilings and a choreography of natural and artistic light: an architecture, which transformed the inspiration of arts into natural shapes, becoming a “second nature” for modern people. This approach is especially impressive to be experienced in constructions like the library in Vyborg (1927-1935), but also in bigger projects like the cultural centre of Wolfsburg (1958-1962). Aalto often also designed small details for the rooms he created, starting from door handles over light elements up to perfectly sized furniture especially adapted to just that one room. He founded the company Artek together with his wife and two more designers in 1935. The company was founded to be an international furniture producer and an art gallery as well. If soon stated to unfold “mundial activities” as Aalto would say, and it became a renowned address of the international avant-garde. The success of Artek emphasized Aalto’s word wide network, which included him in social and political debates and which led him to work in Italy, France, Switzerland, Germany and the USA in the post-war period. That was when different projects emerged, such as a system of standardized and pre-designed home construction in Finland, or a block of apartments in the Berlin Hansa-district for the international constructions exhibition “Interbau” in 1957. The masterworks of his career were big projects like the Finlandia Hall in Helsinki (1975), which has only been completed one year before he passed by, and the Essen Opera House, which has been developed posthumously and opened in 1988. 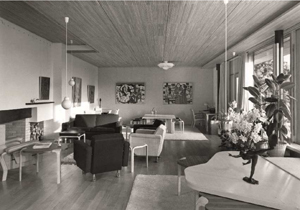 Aalto created more than 400 buildings as well as decens of furniture pieces, glass objects and lamps between the 1920s and 1970s. The exhibition “Alvar Aalto – Second Nature” offers an all-including overview of Aalto’s life and his most important works, but it also directs the attention of the visitor to the less known projects like the Experimental House in Muuratsalo (1952-1953), whose exceptional combination of different construction materials looks like an architecture collage of the 21st century. The exhibits also include historic architecture models, original skethes, furniture, lamps and glass objects, but as well works of famous artists like Alexander Calder, László Moholy-Nagy or Jean Arp. The current persperctive of the exhibition is emphasized by many works of the artist Armin Linke. This one re-documented many constrctions of Aalto on pictures and in films only for this exhibition. The works emerged out of this event communicate with the historic material out of the archives of the Alvar Aalto Museum and other international lenders. 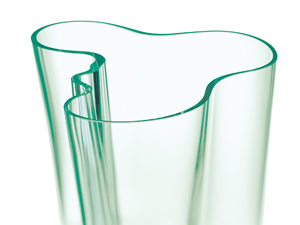 The exhibition “Alvar Aalto – Second Nature” can be visited from the 27th of September 2014 until the 1st of March of 2015 in the Vitra Design Museum in Weil am Rhein and it is accompanied by an all-including catalogue of 688 pages. It includes essays of ten authors, among them Eeva-Liisa Pelkonen, Akos Moravanszky, MoMA-curator Pedro Gadanho, some interviews with Kenneth Frampton and Álvaro Siza, but also a big directory of exhibits with original drawings and images, partly documented for the first time. The homepage of the Vitra Design Museum. The homepage of the Alvar Aalto MUSEO.